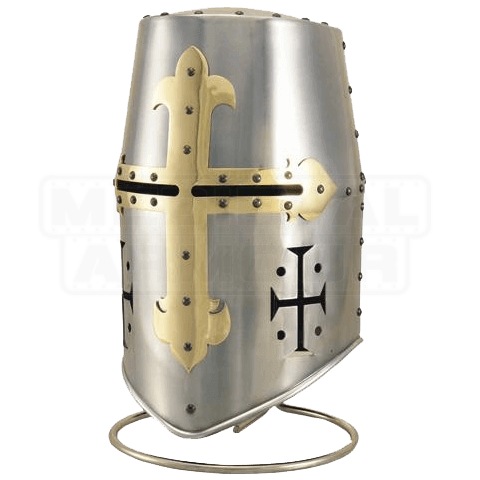 The Templar Knight Great Helm by Marto is a replica reproduction of style of helmet that was typically used by the crusaders, and the Knights Templar, for the whole duration of the Crusades. Also called a pot helm, given the resemblance to a pot, this helm was designed to offer the maximum protection possible to the head. However, because the helmet limits vision, this helmet also found use among cavalry, especially during jousting tournaments, where all a knight needed to look was forward. This helm is made from steel and is enriched by a brass cross, which denotes a knight in service to a religious order. Also included on the helm are a series of cross traceries, which improve air-flow inside the helm.